In 1997, Mercedes-Benz introduced the first M-Class midsize SUV, and it was among the first luxury-branded sport utility vehicles available. Through three redesigns, the M-Class retained its 5-passenger configuration and size, the automaker’s lineup growing to include smaller and larger alternatives, as well as rakish “coupe” versions of some models. Not long ago, Mercedes changed the name to GLE-Class as part of a revamp to its model naming strategy. Now, a fourth-generation 2020 Mercedes-Benz GLE-Class debuts at the 2018 Paris Motor Show. The new GLE remains positioned in the middle of the Mercedes SUV lineup, but is now larger inside and offers an optional third-row seat. It goes on sale in the U.S. in 2019. With the new 2019 GLE-Class, the automaker’s Sensual Purity design language conveys modern luxury, according to Mercedes-Benz. The company employs a long-wheelbase, short-overhang look for the new GLE, with wheels sized from 19 ins. to 22 ins. in diameter. The SUV’s coefficient of drag is just 0.29. Twin power domes give the rounded hood character, streaming up from an octagonal interpretation of the current Mercedes grille, which has rugged-looking horizontal crossbars. New LED intelligent lighting with Ultra Wide Beam illumination flanks the grille, while a chrome front underguard element underlines it. Viewed from the side, a wide C-pillar treatment carries over from the previous GLE (and the M-Class models that came before it). Pillared roof rails also convey visual purpose, as do lower body cladding and wheel arch trim. Around back, the GLE gets a clean look with thin LED taillights and an underguard element flanked by exhaust outlets and reflectors. Thanks in part to a wheelbase stretch of 3.1 ins., the new 2020 Mercedes GLE is larger inside, especially in the back seat. Legroom and headroom improve significantly. Up front, the driver and passenger face an artfully executed dashboard with dual 12.3-in. digital displays, big grab handles on the center console, and a sport steering wheel design. Mercedes claims that the GLE’s controls appear to be milled from solid metal. Mercedes-Benz outlined numerous comfort-related options for the new GLE-Class. Seat Kinetics technology is a new upgrade for the front seats and can make small and subtle changes to the cushion and backrest in order to support changes in the driver’s or front passenger’s posture. In back, power-adjustable second-row seats adjust in multiple ways to improve comfort, and from the cargo area the 40/20/40 split rear seats can be folded flat with the touch of a button. New for 2020, a 2-passenger third-row seat is also available. The GLE’s available Energizing Comfort system networks the music, ambient lighting, and seat massage functions to improve the mood of front-seat occupants. New to this technology is Energizing Coach, which can tailor program recommendations for people wearing a Garmin-based wearable depending on their stress level or the quality of their sleep the night before. Additionally, illuminated running boards make it easier to climb aboard the new GLE-Class. 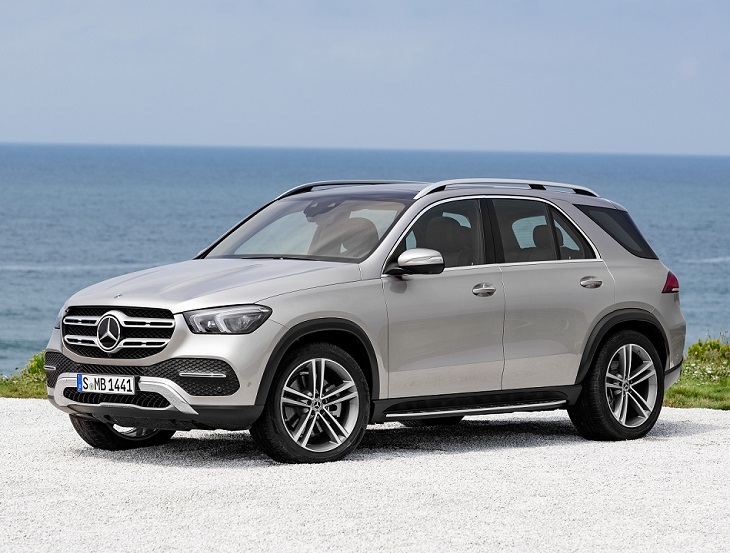 Initially, the 2020 GLE-Class will be offered in a traditional SUV body style and in GLE 350, GLE 350 4Matic, and GLE 450 4Matic model series. Certainly, you can also expect AMG performance-tuned variants as well as a “coupe” body style. The GLE 350 has a new turbocharged, 2.0-liter 4-cylinder engine making 255 horsepower and 273 lb.-ft. of torque. The engine powers the rear wheels, unless you upgrade to 4Matic all-wheel drive (AWD). The GLE 350 4Matic’s AWD system features a fixed 50:50 power split. The GLE 450 4Matic has a turbocharged, 3.0-liter inline 6-cylinder with EQ Boost 48-volt Integrated Starter-Generator (ISG) technology. The engine makes 362 horsepower and 369 lb.-ft. of torque and comes only with a new fully variable version of 4Matic. This AWD system allows up to 100% of engine power to flow to either axle, and also boasts improved off-roading capability. Both versions of the GLE get a 9-speed automatic transmission and a standard steel suspension. A new Airmatic air suspension is an option. Choose the GLE 450 4Matic and you can upgrade to a new E-Active Body Control active air suspension employing a 48-volt electric system. It allows for individual control of spring and damping forces at each wheel to expertly counteract body roll, pitch, and squat. This sophisticated suspension also employs available Road Surface Scan technology, which uses a stereo multi-purpose camera to read the road ahead and tune the underpinnings for upcoming surface anomalies. Curve inclination is another feature, leaning the GLE into a curve to reduce or eliminate centrifugal forces (think of how Lightning McQueen, from the movie Cars, leans into a curve). A free-driving mode is also a part of the E-Active Body Control setup, designed to help extract the GLE from deep snow or sand. New driver-assist and collision-avoidance systems debut with the 2020 GLE-Class. Active Distance Assist cruise control offers a Route-based Speed Adaptation function. Basically, the live traffic data feed informs the cruise control of slowing or stopped traffic ahead, and the vehicle predictively slows itself down to around 60 mph in advance of encountering the clog. That same data feed also slows the GLE for sharper bends and curves, and even road junctions, in order to improve safety. Then, when the GLE has encountered traffic, Active Brake Assist with Cross-Traffic Assist takes action to automatically stop the GLE when it detects the end of the traffic jam ahead. Also, when turning left across traffic, this system will activate the automatic emergency braking function if it is unsafe to do so. Mercedes says it is also offering drivers the ability to turn Active Brake Assist off. Once the GLE is stopped behind the traffic jam, Active Stop-and-Go Assist goes to work. This is an evolved Traffic Jam Assist system that works at speeds up to 37 mph, keeping the GLE in its lane and a safe distance from traffic ahead. Multi-mode front sensors do a better job of recognizing when cars cut in front of you, and the GLE can stop for up to one minute before the system deactivates, requiring the driver to manually accelerate. Additional active safety systems include: Active Steering Assist, Evasive Steering Assist, Active Lane Keeping Assist, Active Emergency Stop Assist, and Active Blind Spot Assist with Exit Warning Assist that works to warn occupants not to open a door if vehicles, motorcycles, or cyclists are approaching from behind. Compared with the outgoing GLE-Class, the new Mercedes-Benz User Experience (MBUX) infotainment and instrumentation system offers 40 new functions, according to the automaker. The MBUX system employs dual 12.3-in. high-resolution displays, mounted next to each other on the dashboard for a widescreen appearance. You can select from Classic, Sport, Progressive, and Understated themes. Artificial intelligence allows the system to learn what its users typically do and then predicts that behavior. Additionally, augmented reality is included for the navigation system, and “Hey Mercedes” natural voice recognition makes MBUX as easy to use as your smartphone or home voice assistant. New MBUX Interior Assistant gesture control capability can recognize when a driver or front passenger is using the touch screen or center touch pad, and tailor the display accordingly. Two different people can program a favorite gesture-activated function, and this optional upgrade supports gesture control of other features, too. The new GLE-Class also offers a full-color, high-resolution head-up display. Owners decide what information appears via the HUD, which projects the information so that it appears to float above the hood approximately 10 feet forward of the driver.